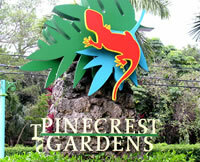 Pinecrest Real EstateContact Us Now! We have the best Pinecrest FL Realtors to help you buy or sell the best real estate in Pinecrest Florida. Pinecrest, Florida encompasses approximately eight square miles and is recognized as one of the most beautiful residential areas in South Florida. Pinecrest,FL houses for sale are mainly estates with half acre to acre size lots. Residents enjoy a superior quality of life in a unique hometown rural atmosphere and also benefit from the many amenities of the Greater Miami Real Estate area. Pinecrest,FL is conveniently located twenty minutes south of Downtown Miami and Miami International Airport. The village has become the central neighborhood for Miami's most family oriented professionals. A peaceful community of acre and half-acre executive estate homes, lush tree-lined streets and parks, Pinecrest FL real estate is highly sought-after for its country-ambiance, big-city proximity and outstanding nationally recognized public and private schools. This neighborly, friendly, casual community boasts a wonderfully responsive local government and police force, as well as rapidly appreciating property values, and glorious parks. In 1996, Pinecrest FL incorporated to maximize its local funding. Now, approximately 20,000 residents call Pinecrest Village home.